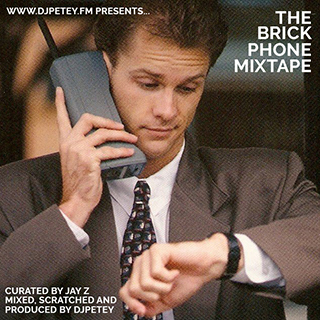 The Brick Phone MixTape | DJPetey.com!!! “Every once in a while, Jay Z will bless us with a curated playlist for Tidal subscribers” And, every once in a while, I take one of those playlists and make a mixtape out of it! “Hov delivers a 35-track playlist titled “Brick Phone” dedicated to hip-hop’s golden era, where the majority of hustlers and drug dealers carried those oversized cell phones. We go way back to ’88 with Boogie Down Productions’ “My Philosophy” featuring rhymes and production by KRS-One. After EPMD’s “So Wat Cha Sayin’” and Big Daddy Kane’s “Ain’t No Half-Steppin’,” hip-hop heads will salute Hov’s genius for putting Gang Starr and Nice and Smooth’s “DWYCK” on here.” Long story short, the man made an incredible playlist, and I did my thing on the cuts and mixes to make it a 59 minute megamix! Old School Hip Hop at its finest! Click HERE to listen / download now. Or, click “read more” below to check out the details.